This newly released film puts a new light on Bill Cunningham and his world of fashion and social events. Fashion has been his passion since he was a child and he started his professional career as a milliner. After a stint photographing for Women’s Wear Daily and Details Magazine he started taking photographs for the New York Times in the early 170’s. Cunningham rides his Schwinn bike everywhere and you may have seenthis distinguished elderly gentleman (he celebrated his 80th birthday a couple of years ago) riding day and night in his blue smock cover-up with a red reflective vest at night. Cunningham lived for many years in a rent-controlled artist’s studio in Carnegie Hall. The only amenity he had in his small apartment was a bed tucked between file cabinets. Even the community bathroom was down the hall! Those files contain an archive of fashion and New York society for the past half-century. 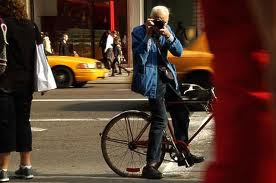 Anyone who is in the fashion, social or not for profit world knows or knows of Bill Cunningham. If you look at the Sunday Styles section of the New York Times you have seen the two full pages he garners every week of images with a minimum of copy. One page is in color and illustrates street fashion and the other in black & white highlights the beautiful people from the social events that have occurred during the past week. For his fashion page he often plants himself at the corner of Fifth Avenue and 57th street where you will find the likes of Trump Tower and Tiffany’s. This is where the world passes. He looks at what people are wearing. It might be a Kennedy or another glitterati passing but he does not concentrate on the faces only the clothes and how they are worn. He also loves the outrageous outfits that people wear. Each week he picks out a theme which might be shoes or people who wear black and designs a page around his theme and photographs. As for his weekly social page he obviously cannot attend all the benefits that occur. There are far too many so Bill Cunningham chooses the events he will attend with his camera according to the sponsors and whether he feels their cause is worthy of attention. If you are into fashion you desperately want to be seen on his page and if your are in the social or business world you want to be seen as attending the worthy cause as well. I must confess that since I attend some of these dinners and usually see him snapping away on his Nikon film camera (he has the film developed at a local shop on Time Square and scans the images at the Times) I have wanted to make it into the Sunday social column. Since I do not like to wear a Tuxedo to these events and look like every other male in the room including the waiters, I put on a black western outfit with a silver bola tie and buckle. 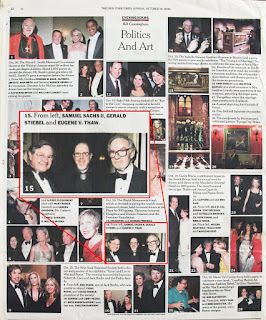 This always attracts Cunningham’s attention and he has taken a number of photos of me and dutifully recorded my name but I only made it into the Times once and that was at a benefit for the World Monuments Fund when I stood between the art dealer/philanthropist Eugene Thaw and museum director Sam Sachs! Cunningham is an important international chronicler of fashion and in 2008 he was made an Officier des Arts et Lettres, a great honor from the French government for his work in fashion. He loves Paris and attends all the fashion shows he can. I sure hope he can continue for sometime and that his archive will be preserved at an institution where it can be consulted but historians for centuries to come.